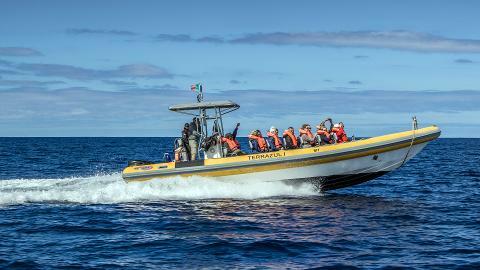 Custom tailored zodiac boat tour with Skipper and Wildlife Guide for up to 12 people - great relation builder for groups, celebrations and private occasions! See Wildlife and cruise the island's scenic coastline, discover hidden places and secluded beaches, snorkel the island’s sea bottom, or… It's up to you! 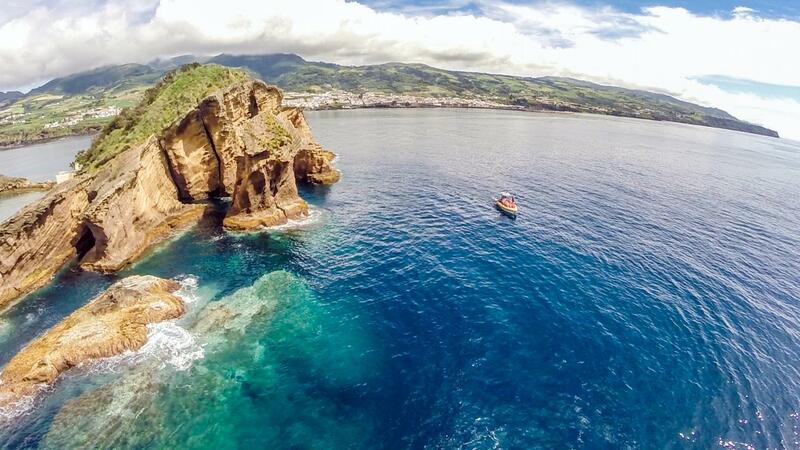 You will meet us at the Marina of Vila Franca do Campo for check-in at the designated time. 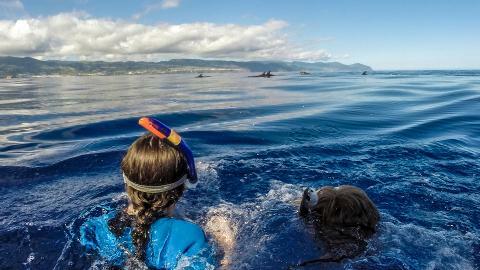 The​ ​journey​ ​start​s on schedule with​ ​a short briefing​ ​introducing you to​ ​local​ marine species and their habitat, and safety onboard. You will then follow your guide to your Zodiac boat, now free to enjoy your personalized fun boat trip to see Whales, Dolphins, Birds and marine wildlife, to cruise the beautiful coastline, for better views to the island’s volcanoes, to discover hidden places, to explore secluded beaches, to snorkel the Atlantic’s coastal marine fauna and flora, or... Let us know what you'd like to do! 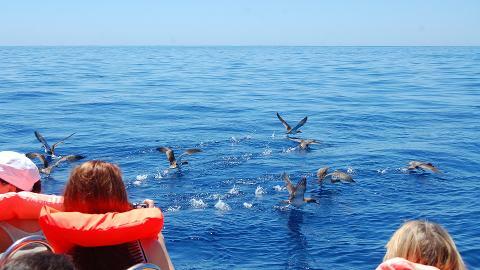 Marine Wildlife can be observed yearlong. 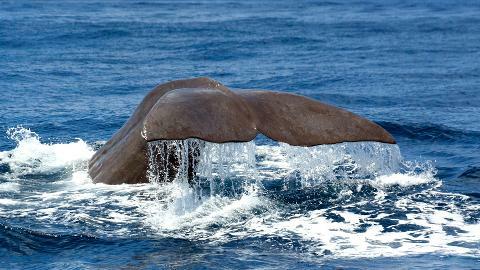 Sperm Whales are resident with 3 additional cetacean species, and marine biodiversity is abundant. From March to June it is the passing of many species of the migratory Baleen Whale giants. 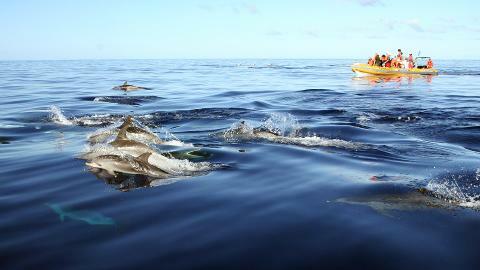 Exclusively between June and September it is possible to swim with any of 4 different species of Dolphins! Our​ ​lookout​ ​high​ ​inland​ ​will​ ​assist the Skipper in finding wildlife and provide​ ​directions​ ​via​ ​VHF​ ​Radio. A knowledgeable Wildlife Guide is there to keep you informed, and ensure the best environmental and conservation standards on tour. The duration of the trip is approximately 3 hours, after which the boat will need to be back at the Marina. Eat light, and bring your personal water supply, towel, swim suit, a full change of warm clothing, sunscreen and chap-stick for the Sun. Light food is permitted onboard, and a Camera is essential, specially for photography lovers - please protect any personal equipment. This tour is inappropriate and inadvisable for anyone pregnant, with weak back, in wheelchair, in delicate health condition, or under the age of 4. Share details about the occasion - we can help you tailor it for everyone.